Clients of Top Rent A Car get exclusive discount of 10% for family tickets! 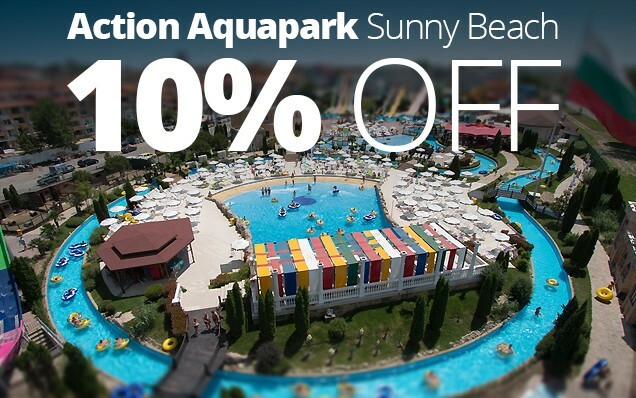 Action Aquapark offers not just water facilities but emotion and wonderful moments during your summer holiday in Bulgaria’s largest resort Sunny Beach. Enjoy the highest (20 m) water slide in Bulgaria, the longest downhill race with tubes, including uphill, climbing, transparent, open and closed area, combined with spectacular lighting effects. Newly Uphill Water Coaster is waiting for water adventure you will never forget. Last year Action Aquapark won two prizes from the most popular travelers web site TripAdvisor: The Certificate of Excellence and 2014 Travelers’ choice winner, so you can expect not just great rides, but great level of service also. TripAdvisor gives 10th place in Europe’ most attractive waterparks for 2014. Only in Action Aquapark you can try and feel the fastest water slide – drop with over 60 km/h speed, the highest – 20 meters in the sky, the longest – 200 meters. The unforgettable attractions which make Action Aquapark unique are: the high-speed slides X-Treme, Free Fall, Kamikaze and Hydrohute; the dynamic Niagara and the mysterious Black Hole; a drift through the park along 330 meters long Lazy River. Catch the wave at the king size Wave Pool and discover the amazing H20 Adventure Island with 8 own slides, geysers, fountains and waterfalls, tunnels and net bridges. Action Aquapark will be an entertainment destination for people of all ages. Get your discount coupon with your next rental from Top Rent A Car!